The Oppo R11 comes in a regular cardboard box, which contains everything you need to get started. There is a 20W VOOC charger, a VOOC-compatible microUSB cable, a pair of headphones with an integrated mic, and a transparent silicone case. There is a pre-applied screen protector on the Oppo R11, and it's entirely up to you to decide whether you want to keep it or rely solely on the Gorilla Glass 5. The Oppo R11 measures 154.5 x 74.8 x 6.8mm and weighs the reasonable 150g. These numbers are the same as the OnePlus 5's, though the R11 has a slimmer profile, be it by a mere half a millimeter. The Oppo R11 is made entirely of metal, something we are already used to in the midrange class. 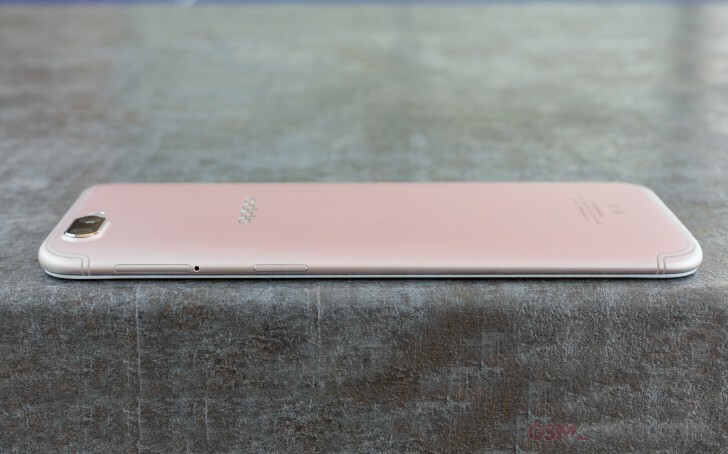 The phone looks extra sharp at just 6.8mm slim, if you don't count a small camera hump. The highlight of the new design are the four-string antenna lines carved out of the shell by customized tungsten blades. The antennas flow with the top and bottom edge, and they don't interfere with the unibody part at all. Oppo is clearly getting up to speed with the latest trend. The body has a matte finish, including the antennas, which makes for both a pleasant feel in hand and secure grip. The somewhat familiar camera hump is accented by a subtle metal frame, polished for a mirror-like effect. There is a similar polished chamfer serving as a border between the screen glass and the metal rear. While those two are very good at drawing all the attention to the camera and the screen, they are prone to scratches and the effect may be eventually ruined over time. The front looks a lot like the OnePlus 5, or shall we say the OnePlus 5 takes after the Oppo R11? In any case, the R11 was announced first, but let's not get caught up in this argument. It's a fact that it's hard to tell the two apart when looked at from the front. The similarities don't end there. The slightly raised 5.5" AMOLED screen is another thing that runs in the family. Both screens look equally sharp at their 1080p resolution but we will compare those side by side in our display chapter shortly. Finally, the fingerprint scanner is integrated in the Home key and is the always-on kind. The polished metal rim is another nice accent here. The sensor worked trouble-free and fast during our time with the R11. While the OnePlus 5 employed a sharp line to divide the front from the back, Oppo went with a subtly curved edge for a seamless and smooth transition. We seem to prefer this approach as it suits the new antenna strip design better, but maybe it's just us. Handling the R11 is nothing short of pleasant, the experience enhanced by the good grip, a promise of durability and an overall premium feel. We are not so keen on the sharp chamfers at the screen glass though, even if they look good or improve the grip - they just felt a little too sharp. 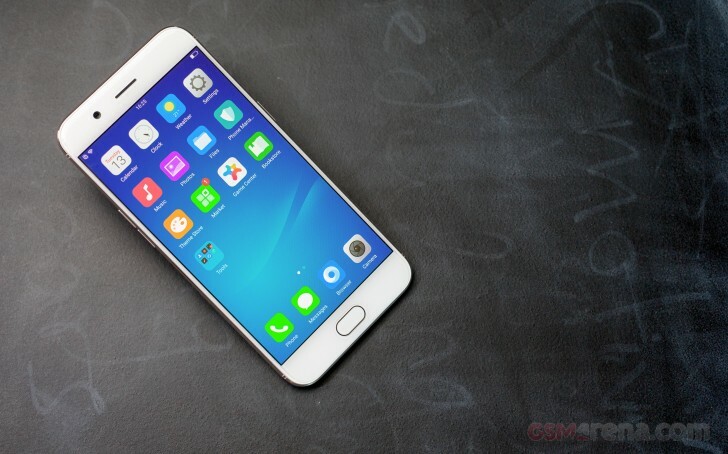 The 5.5" AMOLED screen occupies most of the front with the earpiece and the 20MP selfie camera on top of it. The R11 employs a familiar combination of Android controls below the screen: two capacitive Task Switcher and Back keys either side of a more prominent Home key, also of the capacitive kind. The Task and Back keys are marked with small white icons and are well backlit in the dark. The volume keys are the only thing of interest on the left, while the power/lock key and the hybrid SIM slot are on the right side of the Oppo R11. The top is rather clean with the almost invisible secondary mic, while the bottom features the 3.5mm audio jack, the mouthpiece, and the good ol' microUSB port. 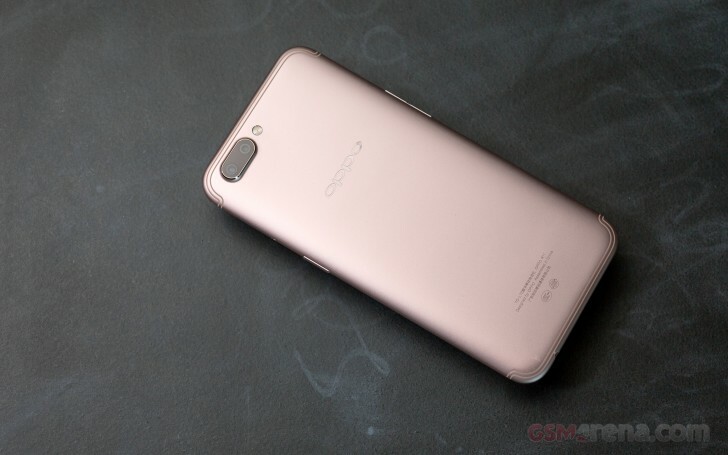 At first, we frowned at Oppo for still taking their time switching to USB-C but we guess it has to do with their VOOC quick charging, in which case the tradeoff is well worth it. 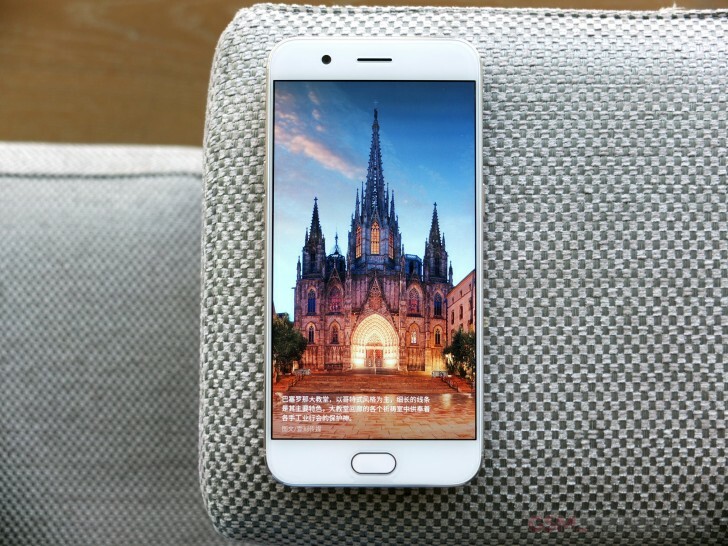 Finally, the Oppo R11's 16+20MP dual-camera setup is slightly protruding on the back. There is a single LED flash next to it, compared to the dual-LED set-up on the OnePlus 5.